Lots of bad horror movies are released into theaters every year, but most of them are bad because of a simple, boring failure of imagination: They’re too derivative, or they run down a checklist of clichés, or they settle for the cheapest of tactics instead of really trying to get under your skin. The Bye Bye Man, this year’s token January fright flick, is different. Make no mistake, it’s plenty generic, to the point where one could easily confuse its conceit for that of two dozen other one-weekend wonders. But on top of the general hoariness, this is also an uncommonly, at times unbelievably inept movie; from its acting to its script to most of its technical aspects, it feels barely fit for the big screen. The Bye Bye Man is so bad, in fact, that it retroactively improves the half-assed Hollywood horror that it’d be lucky to better resemble. Watch it and you may find yourself admiring the baseline competence of an Other Side Of The Door, which at least knows how to hit its marks and score its easy scares. Some run-of-the-mill craftsmanship really would have come in handy here, because the premise itself is at best overly familiar, at worst terminally silly. The title bogeyman is a mute Freddy Krueger type in a hooded robe, arriving with the clink of gold coins to terrorize his victims with unimaginative hallucinations, shortly after someone makes the mistake of learning his goofy name. “Don’t think it, don’t say it,” goes a protective mantra, scrawled obsessively and circularly on an ominous scrap of paper in an old campus house. Can Elliot (Big Love’s Douglas Smith), who’s just started renting the property, really be blamed for thinking about the forbidden name written right underneath the instructions not to think about it? Besides, how can anyone really force themselves to not think about something? As Ray from Ghostbusters could attest, it’s impossible! Horror movies have worked with dumber ideas. The Bye Bye Man, based on a short story by paranormal author Robert Damon Schneck, plants one seed of subtext, suggesting that Elliot harbors the repressed fear that his best friend (Lucien Laviscount) and his girlfriend (Cressida Bonas) might be hooking up behind his back. But operating on anything other than a literal level would require performances of at least some nuance, and The Bye Bye Man is plagued basically top to bottom with terrible acting, from Smith’s bug-eyed “intensity” to Bonas’ losing battle with her American accent to the Wiseau-grade haplessness of the bit players. (You’d think it’d be impossible to overplay screaming at someone about to be hit by a train, but you’d be wrong.) In this deer-in-the-headlights ensemble, sleepwalking drop-ins by Faye Dunaway and Carrie-Anne Moss look distractingly professional. Not that there’s much anyone could do with dialogue so clumsily functional; characters spend most of their screen time either discussing the plot (i.e., agonizing about how to talk about what they can’t talk about) or commenting on what they’re about to do (“I’m going to brush my teeth.”). One could accuse The Bye Bye Man of being excessively expositional, given that it hinges on a monster whose power derives from mere knowledge of his existence, but that would feel like nitpicking a movie whose incompetence spreads in every direction. Drably filming in underdressed locations, director Stacy Title breaks up long stretches of inactivity with bloodless violence—her actors hammily slumping over from point-blank rifle blasts, not a drop of red on them—while providing The Bye Bye Man with a trusty CGI hound that looks like it was ported over from a PlayStation 2 game. All of this would be at least marginally forgivable if the movie provoked a single honest shudder. 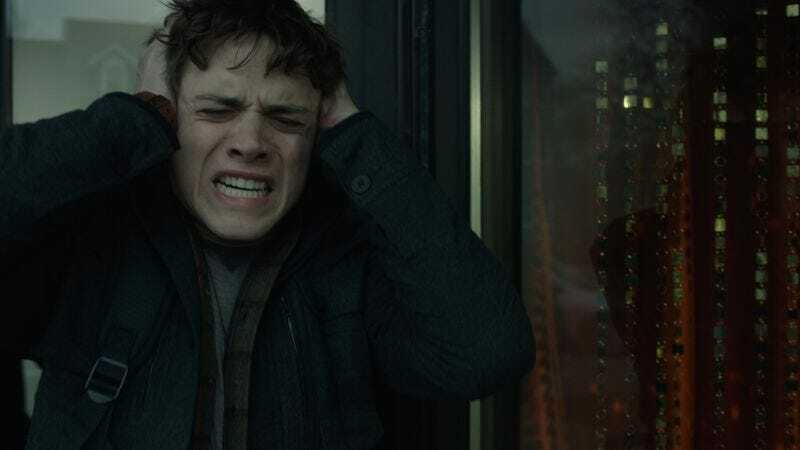 But The Bye Bye Man botches even the simplest of funhouse setups, prolonging its jolts for a small eternity and providing sometimes comically vast amounts of lead room from which the threat can emerge. You know you’ve taken a very wrong turn when a movie leaves you grateful for a cheap, successfully executed jump scare.